The Buffalo Sabres of the Atlantic Division finished the 2017-2018 season in the basement of the league with a 25-45-12 record which was last in the entire NHL. This finish led to them winning the draft lottery and selecting Swedish defenseman Rasmus Dahlin with the first overall pick. The Sabres are a youthful team and our 2018 Buffalo Sabres season preview looks into impact the younger players will have this season. 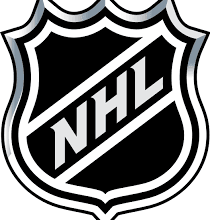 Last season the Sabres finished last in the NHL in goals scored, averaging 2.41 per game. 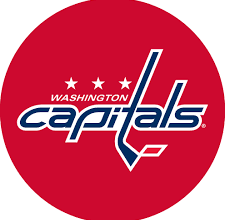 They look to have a good chance to increase their offensive output this upcoming season despite trading away their second leading scorer from last year. They have a youthful group of forwards who have been developing their scoring touches over the last few seasons. Buffalo is led by Jack Eichel who will be entering his fourth NHL season. Eichel has shown that he is capable of carrying the Sabres’ offense, the only question mark with him is his ability to stay healthy. In each of the last two seasons he has missed a total of 36 games due to ankle injuries. In his 67 games played last year he registered 25 goals and 64 points, both tops on Buffalo’s roster. Sam Reinhart is likely to slot into the right wing position on Eichel’s line. Reinhart (25-25-50) has seen steady increases in point totals over this three NHL seasons thus far. His 25 goals last season were tied for the team lead with Eichel. We found in compiling our 2018 Buffalo Sabres season preview that the biggest move the team made involved addressing their goal-scoring woes. To that point, the team acquired winger Jeff Skinner from the Carolina Hurricanes. Skinner (24-25-49) finished second on the Hurricanes in goals and fourth in points last year. He should fit in nicely playing on Eichel’s left side. Casey Mittelstadt is projected to center the Sabres’ second line in the 2018-2019 NHL season. MIttelstadt suited up in six NHL games last year after finishing his freshman year at the University of Minnesota. In those six games he had a goal and four assists. He has the skill level to make an immediate impact for Buffalo. The Sabres may also chose to give Alexander Nylander, their eighth overall pick from the 2016 draft a fulltime shot in the NHL this season. The younger son of former NHL player Michael Nylander has spent the last two years in the AHL but saw action in three late season contests for Buffalo last season. He had one goal in that span but could see more usage this year. The Sabres will also expect offensive contributions from Kyle Okposo (15-29-44) and Jason Pominville (16-18-34). First overall pick Rasmus Dahlin is slated to jump into a role with the Sabres immediately this season. Dahlin is regarded as one of the best defense prospects in many years and owns the tools to make an impact as a rookie. Last season while playing for Frolunda of the Swedish Elite League Dahlin had 20 points in 41 games played. 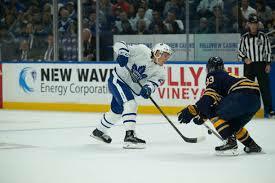 He likely won’t be a superstar in this first NHL season but will play a large role of the Sabres on the backend. Rasmus Ristolainen was a workhorse Buffalo last season. The 6-foot-4-inch Finnish defenseman had 41 points in 73 NHL contests in the 2017-2018 season. He also finished fourth in the league in time on ice, averaging 26:30 minutes per game. 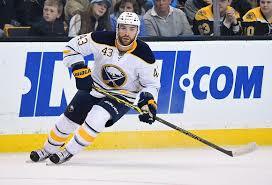 Marco Scandella was the next closest minutes leader on the Sabres averaging 23:19 minutes per game. Scandella had 22 points last year. The Sabres defense is rounded out by Zach Bogosian, Nathan Beaulieu, and possibly Brendan Guhle who played 18 NHL games last season. 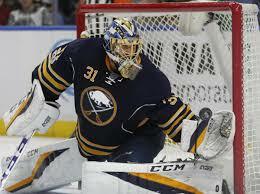 After allowing the third most goals against in the NHL last season, Sabres fans will see a new face in their crease. After his third season with the club, Robin Lehner was not tendered a qualifying offer and made his way over to the New York Islanders. Carter Hutton was signed in his place and will compete to be the teams’ starting netminder. Hutton played the backup role to Jake Allen in 2017-2018 and led the league in both goals against average (2.09) and save percentage (.931). He will look to continue his strong play over a greater workload than the 32 games he saw action in last year. Linus Ullmark will compete for the starting job with Hutton. The 6’4’’ Swedish netminder played only five games in the NHL last year but was strong in his appearances. Along with his 2.00 GAA and .935 save percentage in those games, Ullmark put up strong numbers in the AHL including a 2.44 GAA and .922 save percentage in 44 games played with the Rochester Americans. 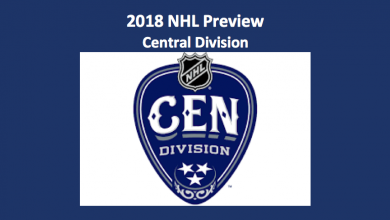 Our 2018 Buffalo Sabres season preview sees this as a real competition for the top netminding spot. The Buffalo Sabres, according to our 2018 Buffalo Sabres season preview, have a very youthful team this season that may surprise. Their young talent looks to be improving and make an impact this season. Overall, they look like an improved club, but not enough to compete with the strength at the top of the Atlantic Division.